All in all, Dagon is a fun, if flawed, release. However, if you are a Stuart Gordon/ Brian Yuzna fan, you should pick this up as it contains all the gore and camp one has come to expect of the pair. "Iä! Iä! Cthulhu fhtagn!" 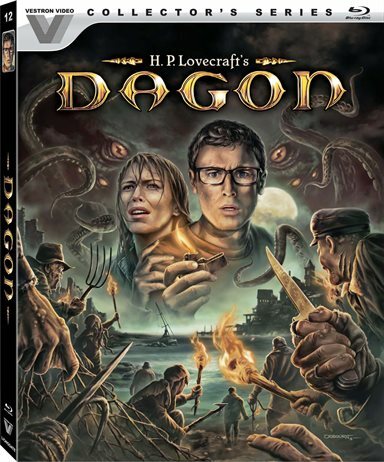 Based on a short story by H.P Lovecraft, the undisputed master of macabre, Dagon follows Paul and his girlfriend, Barbara, as they celebrate the success of their new company on a yacht off the coast of Spain. When a sudden storm smashes their boat on a reef. Barbara and Paul swim to the nearest town for help. The decrepit fishing village on Imboca at first seems to be deserted, but unblinking eyes peer out from boarded-up houses. The strange inhabitants offer little help to the stranded couple. By nightfall, Barbara is missing and Paul finds himself pursued by the entire town… but a town of what? Stuart Gordon (Fortress) returned to form after proving himself fit Direct H. P. Lovecraft material on Re-Animator and From Beyond. After this feature, he directed Dreams in the Witch-house, a Masters of Horror entry. For fans, he has become the definitive director for all things Lovecraftian, at least where the silver screen is concerned. Dagon is far from a perfect film but what it lacks in budget it makes up for in pure love of the source material. The movie is set in the Galicia coast of Northwest Spain and the setting couldn't be better (yes, I know it should have been New England, but trust me, it really works) or more atmospheric. The Town is a real fishing village and becomes almost a central character, in and of itself. Imboca and its denizens are transforming, and they do not take kindly to strangers. Paul (Ezra Godden; Band of Brothers) and Barbara (Raquel Merono; The Mark) are about to fully realize the term, xenophobia, as the townsfolk of Imboca become hostile. Gordon does an excellent job of building tension throughout the film, and this is what I love most about Dagon. In Lovecraft's world, you cannot escape your fate, no matter how hard you try and Paul does try his best, even befriending the last remaining normal person in the town, Ezequiel (Francisco Rabal; Nights in Constantinople) the Village Drunk. It is from Ezequiel that we learn how the village, through its greed and fear, made a pact with Dagon and forever sealed their fate, as well as Paul and Barbara's. With the latest technology the movie has never looked or sounded better, sporting a 1080p hi-def transfer in 16x9, 1.78:1 widescreen, with DTS-HD 5.1 Master Audio. Dagon is shot almost entirely at night and it's raining the entire time making it dreary. I originally saw this film on DVD, in early '02 and I remember the film being dark but the audio was not clear, especially during the scenes with Francisco Rabal. None of those issues exist here. This transfer looks and sounds excellent. The nighttime shots are gloomy but clear and the dialog is out front and clean. I especially enjoyed the ambient music as well as the main theme. All in all this transfer is the best version I have seen. On to the extras, of which there are plenty. There are two new audio commentaries to enjoy in this set. I loved the Gods & Monsters, an Interview of Stuart Gordon by Mick Garris, the Shadows Over Imboca- Interview with Brian Yuzna and of course, if you are a Lovecraft fan, you already know S.T. Joshi, Lovecraft Scholar, who provides some insight into the Dagon tale, and is always interesting to listen to. Also new to this release is the cover artwork which is fantastic, and pulls you into the story immediately. Download Dagon from the iTunes Store in Digial HD. Distributed By: Castelao Productions S.A.
For more information about Dagon visit the FlickDirect Movie Database.